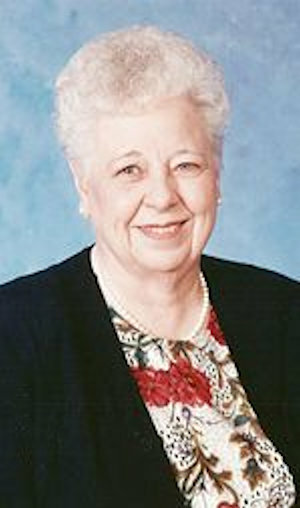 Obituary – Donohoo, Georgia (Divine) « Perry High School Alumni Association, Inc.
– daughter of Mr. and Mrs. S. B. Divine of Pryor, was born in Fallis, Okla., on Oct. 5, 1919. She attended the elementary grades in Perry, district 33 and attended high school in Perry. During her high school career she was in the Red Hots and a member of National Honor Society. Following graduation she expects to attend college or take a business course. Georgia passed away at home at the age of 90. 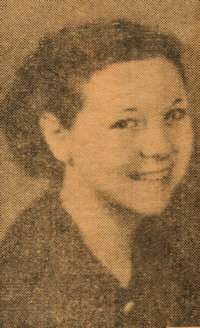 She is the eighth of nine children of Samuel B. and Georgia Sumner Divine. She graduated from Perry High School in 1937. After high school she continued her education at Northern Oklahoma Jr. College in Tonkawa where she obtained her associates degree. On August 19,1943 Georgia married Donald C. Donohoo in Denver, CO. Georgia worked for 1st National Bank in Denver during the war and lived in Molly Brown’s house that her mother-in-law owned. The couple moved from Colorado to Ponca City in 1951 where she began working for Continental Oil Company. She retired from the Research Department in 1983 after 31 years. Georgia was a member of the Order of the Eastern Star, Desk and Derrick, the Elks Lodge and American Legion and VFW auxiliaries. She also served on the election board and volunteered during Red Cross Blood Drives. She enjoyed traveling, trout fishing, reading, crocheting and knitting. She is survived by her daughter Nancy; son-in-law Richard Ford; two grandsons, Scott Ford and Paul Ford and numerous nieces and nephews. She was preceded in death by her husband Don in 1994 and seven brothers and one sister.